Product information "HI98129 COMBO Tester for pH/EC/TDS/C° up to 3999 µS, waterproof"
The HI98129 makes measuring pH quick and easy! 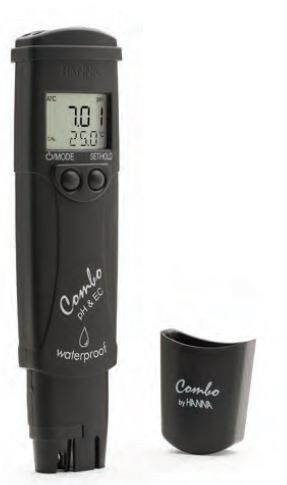 This lightweight, waterproof tester offers high accuracy pH, EC/TDS and temperature measurements in a single handheld unit! No more switching between meters for your routine measurements. The HI98129 is a highly accurate, waterproof pH meter that can also measure EC/TDS and temperature. This floating, waterproof combination tester has an easy to read, LCD and an automatic shut-off. In addition, pH and EC/TDS readings are automatically temperature-compensated to prevent temperature related variations in your measurements. The HI98129 tester features an easy to replace pH electrode cartridge with an extendable cloth junction. The extendable cloth junction helps increase electrode life and the replaceable pH cartridge means that this tester does not need to be thrown away when the pH sensor is exhausted. Also, the sturdy, snap-in connector means there are no pins to bend or break! High Accuracy EC/TDS graphite probe? ?The graphite conductivity probe provides greater accuracy because it cannot be contaminated by salt deposits in the solution. The exposed temperature sensor provides fast response times and guarantees highly accurate temperature compensated readings. Fast, efficient accurate and portable, the Combo pH, EC/TDS and temperature tester combines all the features users have requested and more! HI98129 (Combo) is supplied with HI73127 pH electrode and HI73128 electrode removal tool, batteries and instructions. Related links to "HI98129 COMBO Tester for pH/EC/TDS/C° up to 3999 µS, waterproof"
Customer evaluation for "HI98129 COMBO Tester for pH/EC/TDS/C° up to 3999 µS, waterproof"